Orochi (オロチ) is the main villain of the Orochi Saga and the final Boss of The King of Fighters '97. Orochi was sealed 1,800 years ago by the three sacred treasures of Japan. The three clan's descendants are charged with protecting the seal over him. 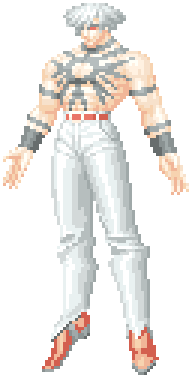 In KOF '97, his spirit possesses Chris' body to fight in the mortal realm. He was sealed again at the climax of the '97 tournament but the seal surrounding him has been broken in recent games, the reasons why are still unknown but it revolves around awakening him again. Orochi has eight mortal followers in his name referred to as the "Hakketsushū" . Two are assassins (Mature and Vice), and two are elementalists (Ryuji Yamazaki and Gaidell, Leona's biological father). Four of them are powerful elemental warriors called "The Four Heavenly Kings" (Goenitz, Shermie, Yashiro and Chris). They are the most loyal to Orochi, working to set him free from the concealment by the Yata clan. Members of his bloodline are known to undergo a berserker stage known as the "Riot of the Blood". Though cases are relatively rare, users become incoherent and attempt to kill any in their path. They often have no memory of their actions and are prone to being exceedingly violent. The known afflicted descendants are Iori Yagami and Leona Heidern. This page was last edited on 18 January 2009, at 11:50.